“You’ll Be Fine, Just Trust God” from Christian Faith Publishing author Michael D. Hale II is a book that shows the power of faith during times of crisis and the true power of family. “You’ll Be Fine, Just Trust God”: Shows the power of God and family in times of crisis, as a family deals with financial hardships that expose deeper issues. “You’ll Be Fine, Just Trust God” is the creation of published author, Michael D. Hale II, who discovered a talent for writing in college and the author wishes to use that gift for a greater purpose. Published by Christian Faith Publishing, Michael D. Hale II’s new book shows the how the bonds of family do more than just bind people together and how the power of faith can help in any crisis. In this instance, a family is marred by financial problems that expose deeper wounds inside their relationships. While dealing with their parents’ problems, Dwayne and Kiere start to have issues of their own. Dwayne is adjusting to the role of the family leader and Kiere is having strange dreams and visions. By putting faith in each other and God the family begins to rebuild after disaster. 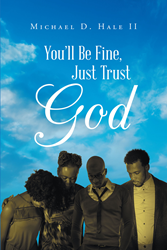 View a synopsis of “You’ll Be Fine, Just Trust God” on YouTube. Consumers can purchase “You’ll Be Fine, Just Trust God” at traditional brick & mortar bookstores, or online at Amazon.com, Apple iTunes store, Kobo or Barnes and Noble. For additional information or inquiries about “You’ll Be Fine, Just Trust God”, contact the Christian Faith Publishing media department at 866-554-0919.